Hello guys, at first i want to apologize for my poor English. Now let me give you a small intro of myself. I’m doing forex trading since 2009. Then i switched to binary trading back in 2012, my broker was 24options. According to my research they were the best in that period of time. But their system was heavily rigged, at first you make money then you lose it all because of their nasty chart manipulation. However, today im not here to talk about 24options. Let’s get in to the point now. I have been trading on iqoption’s practice account for a year now. Suddenly i got a call from a gentleman named George few days ago, he introduced himself as my account manager on iq option. He seemed like a nice guy, so i told him to keep in touch. His call boosted me up and encouraged me to deposit some money and give it a shot. But before that i wanted to be more sure about the legitimacy of iqoption. My first attempt was searching the term “Iq option binary trading” on youtube. 90% videos were about either signal selling services or bad experiences with iqoption. Comment sections were more informative and full of sad stories. All those things made me really confused. Then i went through some google search results, forum posts etc. SAME THING every where. I’m not saying they are scam, but where in the world those successful traders of iq option live in? Why there is not a single professional trader on internet who could come up and say “YES IQ OPTION IS REAL”. It’s really easy to spot the real statement and paid statement on internet, paid reviews are every where! Where are the real traders, is there really any? i started to doubt. Then i sent an email to my account manager George, it was my last hope to get out of that puzzled situation. But his reply disappointed me to the fullest. 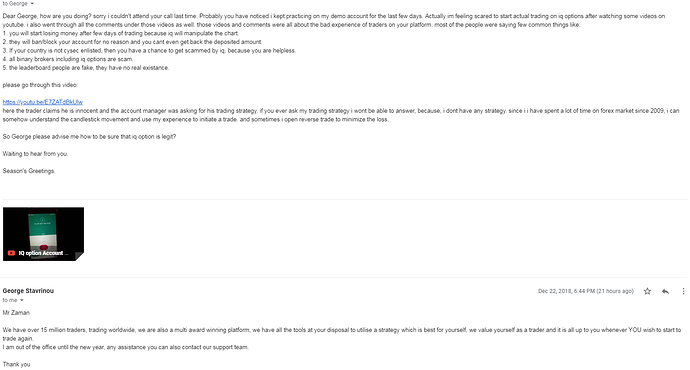 He did not answer a single question rather saying they are a award winning broker, they have millions of traders. Anyone can buy awards with right amount of money. And where are those millions of traders, they dont go to youtube? they dont browse forums? I’m gonna attach the screenshot of that email i’m talking about so that you guys can judge by yourself. Still i’m not saying they r scam, I’m still gonna deposit money there to trade. No, now its not about making money, it’s now all about getting the answers of those unanswered questions, it’s all about enlightening the world! I will make a different thread here to share my daily experience with them. I HOPE I WILL END THE CURIOSITY OF MILLIONS THOSE WHO ARE INTERESTED TO KNOW MORE ABOUT THEM! First thing is they operate out of Cyprus. I will never deal with any financial firm based in Cyprus. Cyprus is a proven haven for money laundering and Russian mafia money, as well as having a light-weight financial sector regulator. It is ranked 42nd on Transparency International’s Corruption Perception Index. Financial sector companies do not just register there for the mild winter climate. They base there because they cannot be touched if things go wrong, and its a place where you can hide your illicit profits and buy political protection if you need to. dont use Iqoption. i have many clients who just cant withdraw their profits and initial deposit. as you know, binary option trading is a zero-sum or negative sum game. when traders win profits means the broker lose money. you know that iqoption pay up to $1200 to you for refer a new client who deposit 500 or more. lol; now you can see how do they make money in this industry. 95% brokers of binary option are scams, 24option, Lbinary, Ctoption…endless list of scam brokers. they rob money from clients and leave a bad fame for binary option industry. Thanks for your nice information , i think those who willing to trade in binary should avoid this all scams. winner, deposited real money and within minutes lost it all?? surely i cannot be that bad?went back to demo account and was up again 100/200k within mjnutes , this is when i decided to take it on the chin and walk away !! Hi DipuZaman and everyone else out there. I have doubts too, and I am Afrikaans speaking so my English is even worse than your’s. I am trading with IQ for about 2 years. Still a newby… learning and receiving phone calls from who knows who, every day at more or less the same time. In the beginning…just like with you…i answered and they told me the same…that they are my manager from IQ and they want to assist me opening an account and depositing money. Fortunately I stood fast and told them I do not need assistance…just to hear from them the next day again. One day I told this one guy to stop calling me and put the phone down. He was so arrogant as to phone me again and said he’s going to report me. He was really as rude as can be. I am still with IQ and to test them , I made a withdrawal…and it went smooth. But on further investigation I realize this was not winnings I withdrew. It was money that I deposited 14 days prior to the withdrawal. If you want to withdraw winnings they have extra documents on request that makes it almost impossible. They requested from me an old card number that does not exist anymore. So I still don’t know how to get my money. I have asked their support group if they are registered at a regulatory body and what the name is. She said they are regulated by the law of Cypress. Laugh out loud !!! I really do not think they are not legit, but I agree with you where are all the successful people trading with them. All the leader board guys…please let us hear from you. Thank you…nadextrader.net for the info. I am with IQ still, because of their user friendly platform. But if that is how they operate, I have to move. Are you a broker yourself? Wow, thats really frustrating and horrible! Thanks for your humble and informative reply. Please keep us updated regarding your IQ journey. it might be a cleverly written program? lol, on the demo they make you win money and then attract you to trade real money; but on the real money, they can manipulate prices and let you lose. Iqoption is a broker, they trade against you. they can only make money when you lose. we only use nadex, which is an exchange. they make money via commission fee. when you make money other trader lose money, nadex dont make money when you lose and also dont lose money when you make profits. Thank you for your prompt answer. I am RSA based so I can not use Nadax. I have negative experience with IQ. Do you perhaps know of anyone with a positive experience with them? any thoughts on Dmitry Vladislav ?